In this step you create a web server to connect to the Amazon RDS DB instance that you created in Step 1: Create an RDS DB Instance. First you create an Amazon EC2 instance in the public subnet of your VPC. Choose EC2 Dashboard, and then choose Launch Instance, as shown following. 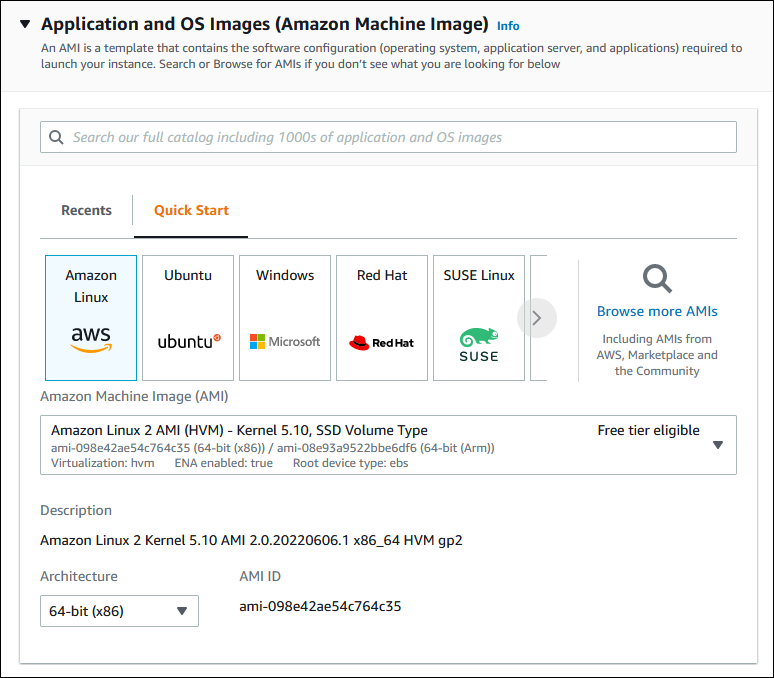 Choose the Amazon Linux Amazon Machine Image (AMI), as shown following. Choose the t2.small instance type, as shown following, and then choose Next: Configure Instance Details. Network: Choose the VPC with both public and private subnets that you chose for the DB instance, such as the tutorial-vpc (vpc-identifier) created in Create a VPC with Private and Public Subnets. Subnet: Choose an existing public subnet, such as subnet-identifier | Tutorial public | us-west-2a created in Create a VPC Security Group for a Public Web Server. Auto-assign Public IP: Choose Enable. On the Add Storage page, keep the default values and choose Next: Add Tags. On the Add Tags page, shown following, choose Add Tag, then enter Name for Key and enter tutorial-web-server for Value. Choose Next: Configure Security Group. 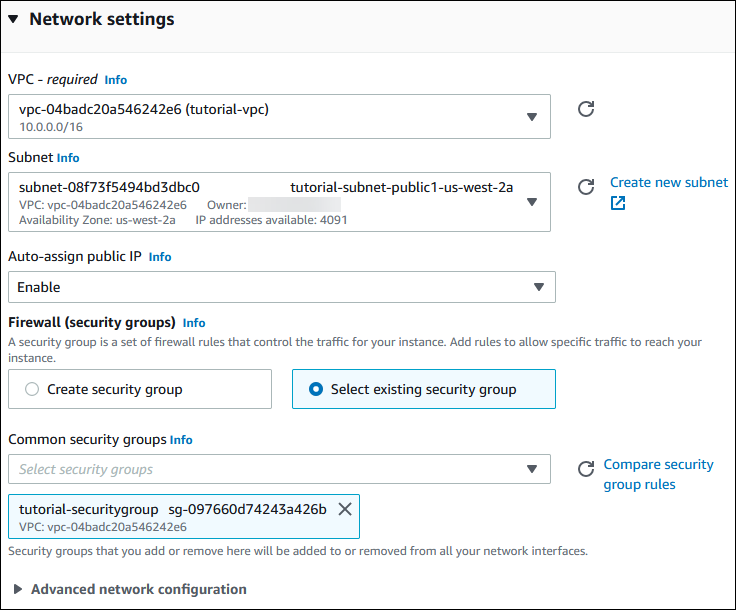 On the Configure Security Group page, shown following, choose Select an existing security group, and then choose an existing security group, such as the tutorial-securitygroup created in Create a VPC Security Group for a Public Web Server. The security group must include inbound rules for SSH and HTTP access. On the Review Instance Launch page, shown following, verify your settings and then choose Launch. On the Select an existing key pair or create a new key pair page, shown following, choose Create a new key pair and set Key pair name to tutorial-key-pair. Choose Download Key Pair, and then save the key pair file on your local machine. You use this key pair file to connect to your EC2 instance. 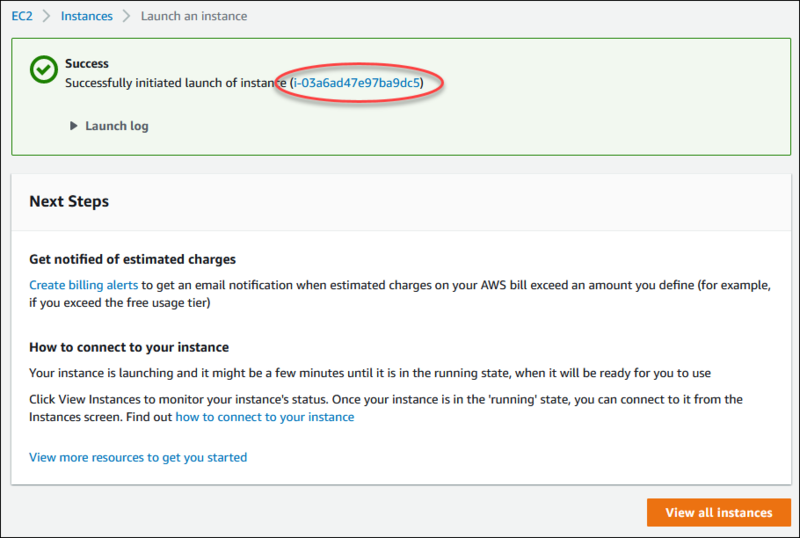 To launch your EC2 instance, choose Launch Instances. On the Launch Status page, shown following, note the identifier for your new EC2 instance, for example: i-0288d65fd4470b6a9. To find your instance, choose View Instances. Wait until Instance Status for your instance reads as running before continuing. Next you connect to your EC2 instance and install the web server. 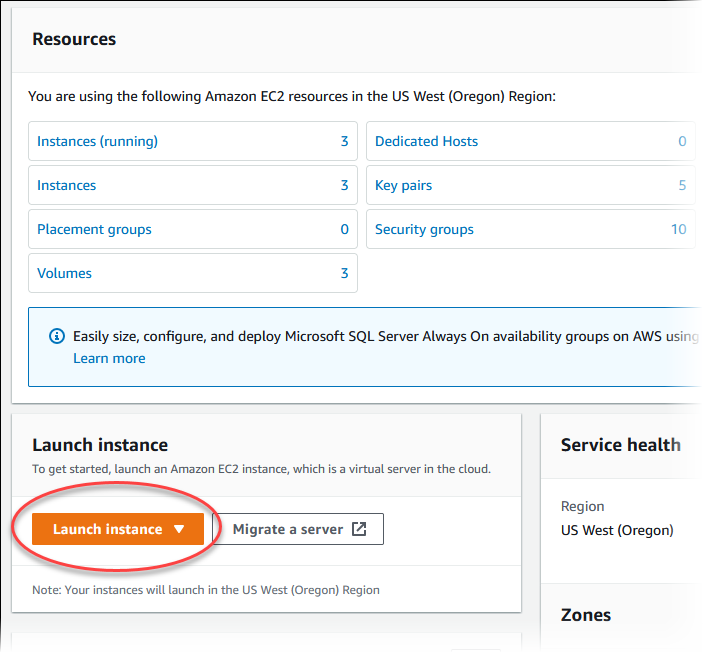 To connect to the EC2 instance that you created earlier, follow the steps in Connect to Your Instance. The -y option installs the updates without asking for confirmation. To examine updates before installing, omit this option. After the updates complete, install the Apache web server with the PHP software package using the yum install command, which installs multiple software packages and related dependencies at the same time. For more information, see Updating Instance Software. Start the web server with the command shown following. You can test that your web server is properly installed and started by entering the public DNS name of your EC2 instance in the address bar of a web browser, for example: http://ec2-42-8-168-21.us-west-1.compute.amazonaws.com. If your web server is running, then you see the Apache test page. If you don't see the Apache test page, then verify that your inbound rules for the VPC security group that you created in Tutorial: Create an Amazon VPC for Use with an Amazon RDS DB Instance include a rule allowing HTTP (port 80) access for the IP address you use to connect to the web server. The Apache test page appears only when there is no content in the document root directory, /var/www/html. After you add content to the document root directory, your content appears at the public DNS address of your EC2 instance instead of the Apache test page. Configure the web server to start with each system boot using the chkconfig command. To allow ec2-user to manage files in the default root directory for your Apache web server, you need to modify the ownership and permissions of the /var/www directory. In this tutorial, you add a group named www to your EC2 instance, and then you give that group ownership of the /var/www directory and add write permissions for the group. Any members of that group can then add, delete, and modify files for the web server. Add the www group to your EC2 instance with the following command. Add the ec2-user user to the www group. To refresh your permissions and include the new www group, log out. Log back in again and verify that the www group exists with the groups command. Change the group ownership of the /var/www directory and its contents to the www group. Change the directory permissions of /var/www and its subdirectories to add group write permissions and set the group ID on subdirectories created in the future. Recursively change the permissions for files in the /var/www directory and its subdirectories to add group write permissions. Next, you add content to your Apache web server that connects to your Amazon RDS DB instance. While still connected to your EC2 instance, change the directory to /var/www and create a new subdirectory named inc. Create a new file in the inc directory named dbinfo.inc, and then edit the file by calling nano (or the editor of your choice). Add the following contents to the dbinfo.inc file, where endpoint is the endpoint of your RDS MySQL DB instance, without the port, and master password is the master password for your RDS MySQL DB instance. Placing the user name and password information in a folder that is not part of the document root for your web server reduces the possibility of your security information being exposed. Save and close the dbinfo.inc file. Change the directory to /var/www/html. Create a new file in the html directory named SamplePage.php, and then edit the file by calling nano (or the editor of your choice). Save and close the SamplePage.php file. Verify that your web server successfully connects to your RDS MySQL DB instance by opening a web browser and browsing to http://EC2 instance endpoint/SamplePage.php, for example: http://ec2-55-122-41-31.us-west-2.compute.amazonaws.com/SamplePage.php. You can use SamplePage.php to add data to your RDS MySQL DB instance. The data that you add is then displayed on the page.